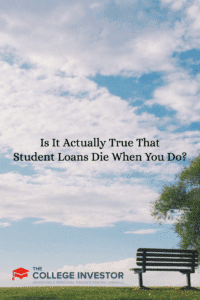 Home » Is It Actually True That Student Loans Die When You Do? Today we’re talking about a tough subject: what happens when you die? 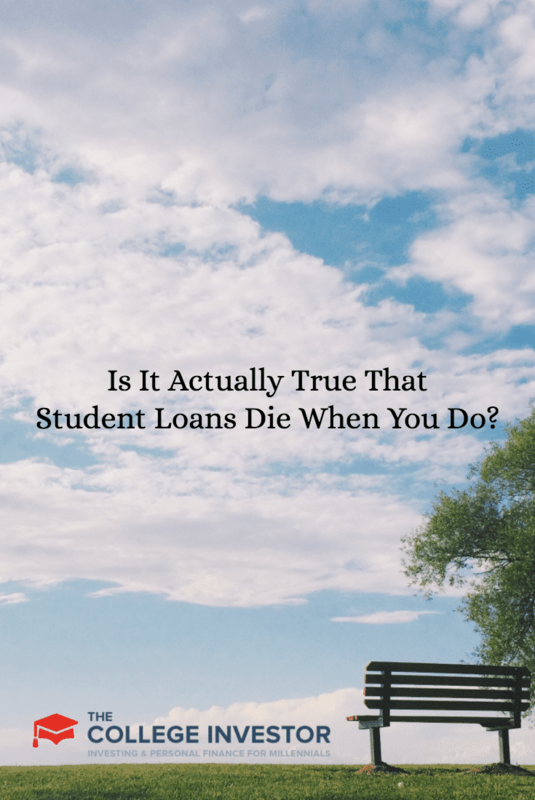 Specially, what happens to your student loans when you die? Do your student loans die with you (meaning your family is free and clear), or will someone else have to experience the burden of your student loan debt? It’s important to know what will happen — because if you don’t follow these steps, your family could be liable for your student loans. Recently, I discovered a couple tragic stories that I wanted to share with you about death and student loan debt. First is the story of Francisco Reynoso. This is the typical tragic story I read about student loan debt. His son was accepted to Boston’s Berklee College of Music, but he needed student loans to pay for it. However, the Federal student loans weren’t enough and his son had to take out private loans. The trouble started when Francisco cosigned for the loans. Right after graduation, Francisco’s son was tragically killed. But since Francisco cosigned the student loans, for the banks, the debt was very much alive. After the death of his son, the banks started coming to him to try and collect the debt. The sad part is that he is technically on the hook for the private student loans that he cosigned. Here’s a case where the student loans didn’t die. The second tragic story happens with Parent PLUS Loans. While these are Federal loans, they can still cause financial nightmares after the borrower dies. For example, there is the story of Roswell Friend. His mother took out $55,000 in Parent PLUS Loans to pay for school. When he died, the government did the right thing and erased the debt (since they are Federal loans). However, since the debt was cancelled and it was actually taken out by the parent, Sallie Mae sent a 1099-C to the mother due to the cancellation-of-debt income. This left the mother with a tax bill of $14,000 due to the “additional income.” While not having to repay the full loan, this was still a lot of money to owe. For most Federal student loans, the debt is forgiven when the student or borrower dies. All that is required is that you provide the student loan servicing company with a certificate of death, and the loan will be gone. It is also true for private student loans, as long as nobody cosigned the loan. If the student who died was the only borrower, the loan will die with them. However, there are two types of student loans that don’t die with you. First, private student loans with a cosigner don’t die. When someone cosigns the loan (maybe a parent or other relative), they are just as responsible for the loan as the student or borrower. That means, if the student dies, the cosigner still has to pay the loan back. Second, PLUS loans can be a headache to deal with. While they technically are discharged, the parent who took out the loan could be left with a 1099-C, which increases your income and makes you pay taxes on the amount of the PLUS loan that was forgiven. There are two simple ways to protect yourself and make sure that your student loans don’t cause problems for your family. First, never cosign a loan for school. Student loan debt is the worst debt to have, and it can be a huge burden to parents, especially in the time of grieving. If you need student needs loans, stick to Federal student loans. Second, consider taking out life insurance on your college student until the debt you’re liable for is gone. For example, if you cosigned a loan for $20,000, consider purchasing a life insurance policy worth $20,000 on your student. The policy would be extremely inexpensive (probably less than $10 per month), but if something should happen, the insurance money would be there to pay off the outstanding debt. Look at a comparison tool like Policygenius and see how easy it is to get a life insurance policy on a young, healthy person. In just a few minutes you can see how inexpensive it would be. Check out Policygenius here. Have you taken steps to protect your family from your student loan debt? I’m sure it is an uncomfortable thing for parents to think about, but it is extremely necessary to purchase a life insurance policy when co-signing for large student loans. I too have read several horror stories of parents on the hook for tens of thousand, and sometimes hundreds of thousands of dollars for student loans after a child passes away. Having the loss of a child is a difficult enough process without getting a large student loan bill you can’t pay. I just used an online Life Insurance calculator that showed a non smoking 18 year old can get a $100,000 10 year policy for $7 a month. This isn’t about getting something for nothing. Do your home work! Most of us who owe student loans pay hundreds of dollars each month while the amount we owe only continues to increase. I think that’s solid advice to consider taking out a life insurance policy on your student until the loans are paid off. The two examples you gave highlight the danger inherent in student loans if you get yourself into them without really knowing the potential ramifications. Oh wow good information. I didn’t know about this. I have Federal student loans – and very little left – so I guess my parents are off the hook but I know people that have private loans and I’m not sure they know about this. I’ll share this with them. Glad I could shed light on this tough topic for you. I got a student loan of $500.00 from the finance office in 1973. Will the federal govmt. take my insurance money at the time of my death? Please give me some information on this. They can use your estate to pay for your loan debt. If your insurance is paid to someone else, it’s not part of your estate. However, I’m not an insurance or an estate expert, so consult a lawyer. What will happen to my mother’s private student loan debt if she were to pass away? I am not a co-signer on the loan. I am an only child and my father has passed away. She has been deferring her loan payments based on her low income level, but she has a balance of approximately $70,000. She consulted with a CPA at the senior center in her town that said I would become responsible for this debt in the event of her death, but my husband disagrees. Thank you! If you’re not the cosigner, you are not responsible at all. Her estate will be responsible. Chances are, since you’re the only child, you’ll be responsible for handling the estate. That means, any money left will need to go towards her debts (including the student loans) before you get any potential inheritance. This likely won’t even matter though, because you said she’s low income so likely doesn’t have much in assets. In the end, the loan should die with her. Hello Robert. Thank you for this fountain of information, my mom unexpectedly passed away last week leaving an insurmountable amount of parent plus loan debt to be handled without her salary. My step dad was the consigner, but doesn’t make close to enough money to cover the cost. Because of the federal nature of the parent plus loans will the debt be forgiven or will navient come after him for payment? Are you positive the Parent PLUS Loan had an “endorser”. Parent PLUS Loans very rarely have endorsers (effectively cosigners, but a bit different) in the rare circumstance that the single parent is denied the loan (typically due to a bankruptcy). First step would be to verify who actually owns the loan and is on it. You can pull the credit report on Annualcreditreport.com if you no longer can find the original paperwork. If only your mother was on the loan, you can send in the death certificate and the loan will be discharged (but expect 1099-C for her estate). If your father was an endorser on the loan, he is just as responsible for it. As such, you’d find this article useful: What To Do If You Can’t Afford Your Parent PLUS Loans. Does a step parent have to pay back a parent plus loan if the actual parent who took out the loan dies? No, a Parent PLUS Loan is eligible for a Death Discharge if the parent who took out the loan dies. You need to submit a Death Discharge form. If a person has a large federal student loan debt and also has equity in a home, will the government take the house upon death, or can the person leave it to another person in a will? Federal student loans are discharged on death. That means they go away, and don’t have to be paid.